Consulting magazine has named Casey Baldwin, a Senior Manager with Cognizant Business Consulting, among the 2016 Rising Stars of the Profession for Excellence in Human Resources. 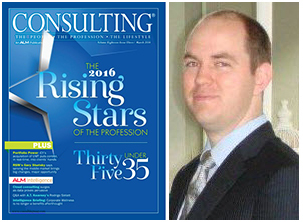 The 2016 Rising Stars of the Profession is Consulting magazine’s annual look at consultants under the age of 35 who are making the biggest impact and redefining the consulting profession. “His deep knowledge of complex business transformation issues has made him a trusted advisor with significant clients where he has led a team of seven consultants providing change management solutions in areas such as: stakeholder engagement, communications strategy and training in execution of systems enhancement across multiple divisions of a large healthcare company,” the magazine notes in a feature titled Thirty Five Under 35.